Edited posts count decreased- Under what scenarios can this occur? 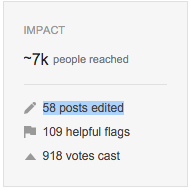 On Friday, I distinctly remember my edited posts count was on 61. But today when I opened SO, it has somehow decreased to 58. Has it happened because maybe some posts were deleted? What are the scenarios in which a user may lose progress on editing badges? This community wiki also states that deleted posts don't count. So, it appears that badge progress was decreased by three because three posts were deleted. Not the answer you're looking for? Browse other questions tagged discussion support edits deleted-questions deleted-answers . For “User was removed” event, why are editing reputation points rolled back? It can be sort of unfair? What's the difference between the quality of a question and the quality of an answer? Is it wrong to target edit a single user's posts?